On a lazy Sunday morning, my hubby decided to surprise me with breakfast in bed! It was so refreshing waking up to the aroma of freshly brewed coffee and crispy fried bacon. My 5 year old happily comments on this …. “mumma, it is your holiday from the kitchen today. Dad and I will do all the cooking!” I was elated!! My little one seemed to be growing up so soon, I had mixed feelings of happiness, sadness and pride! We used the canned Baked Beans. Baked beans are known for their tangy sweetness, colour and buttery bean flavor. You can also use kidney beans or white beans for this dish. In a large saucepan, add the Olive Oil, and once its heated, add the chillies and garlic. Saute lightly. Next, add the onions and sauté till the onions turn brownish and the oil leaves the sides. Add the tomatoes and cook the mixture till the tomatoes become soft and mushy. Now, add the canned Baked Beans and give it a good stir. Let it simmer for 5 minutes. Add the Tabasco sauce and mix well. Lightly toast the bread slices without using butter in a non-stick frying pan and keep aside. Add a slice of Ham and cheese to it. 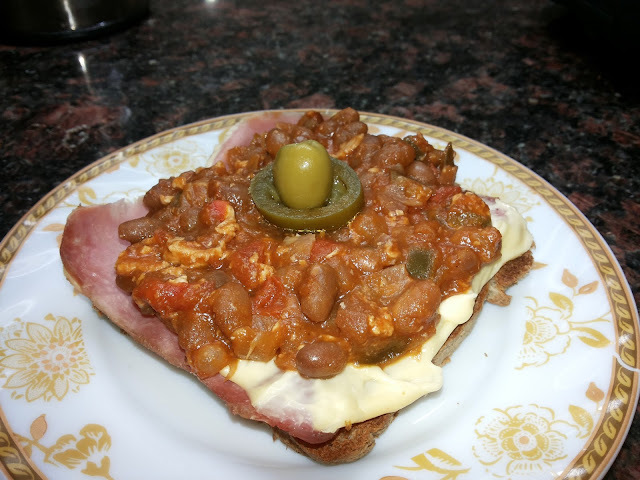 Top it up with the baked beans and spread evenly over the bread slice. Bake in a pre-heated oven 350°f (160°c) for 7-8 minutes or till the cheese melts. My hubby served it with freshly brewed coffee and crispy fried bacon on the side.